Is it a violation of privacy to store user data and sell it for a profit or use it to better target your products to consumers? The corporations claim they provide better tailored services to us, the consumer, by analyzing the data we provide online and can offer their services free of charge and do all this while trying their best to keep it from the hands of criminals by spending millions to secure it behind firewalls and encryption. Advocates for the consumer demand full transparency and disclosure of the uses of data but each attempt to pass a bill is blocked by the tech companies. The war wages on and we may not see an end anytime soon. But what happens to our online privacy in the meantime? Mr.Nagle, referenced in Paralyzed Man Uses Mind to Move Cursor by Andrew Pollack may worry that his thoughts will be monitored and stored by the manufacturer of any of the software or hardware he is using. His story gives hope to many paralyzed people but also is an example of the problems we will face in the near future when such technologies will be easily accessible. If we can’t agree on privacy now when we use a keyboard to input our thoughts on the computer, what will we face when our thoughts will be connected to the computer directly? 1. What is file sharing? 2. What is P2P File Sharing? Users connecting to a peer-to-peer network to search for files on the computers of other users connected to the same network. The article The BitTorrent Effect by Clive Thomson is talking about one such service and the implications it has in the movie and music industry. Copyrighted movies or music are placed on these networks for others to download and Hollywood is worrying that the movies industry is going to go the same way the music industry went because of the losses in revenue. 3. What are some examples of P2P file sharing? LimeWire, KaZaa, eMule, Vuze, BitTorrent, uTorrent. A new technology to facilitate learning through immersion in the topic For example studying historical events by connecting to a machine with a 3D visor and making it seem you are present in the time the event took place. Or studying biology with the same device and being able to zoom in to a molecular level and see cellular structures. 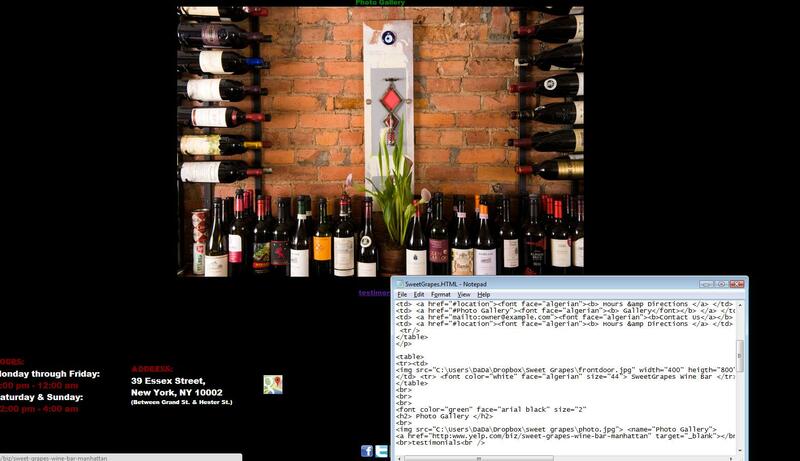 This is a screen capture of a web site I’m working on for a wine bar in LES. New media is everywhere but can disappear with the touch of a button, the “Delete” button. All that was ever created online, resides on someone’s computer or on a server somewhere and can be edited or deleted at any time by the content’s creator. Also, media is interactive, it continually changes hands among users and interacts with them. Feedback on features, quality, content reaches the responsible party much faster than in the old age of telegraph or mail. Media creators, be them writers, software engineers, movie directors, entrepreneurs, etc can easily receive and adapt to feedback from the only people that matters: the consumer of media. As the Twitter article “Twitter Serves Up Ideas From Its Followers” describes, even if a service is intended for a certain type of use and the people behind it think they have it all covered, there will always be someone who will think of a way to improve it. Keeping the e-ears open, you can update and improve the media simply by listening to the consumer feedback. What are different ways these virtual worlds can be used? Virtual worlds can be used by companies to have virtual meetings, scientists to collaborate on projects, emergency services to run drills and train first-responders. Also, a company launching a new product could first launch it on one of the virtual world servers to see how the consumers respond to it before committing to a real life campaign. Hospitals can train their staff in emergencies, companies can arrange and hold meetings across the globe without leaving their home town, and scientists can collaborate on projects, all online in environments similar to Second Life. At the same time, a terrorist organization can familiarize itself with the floor plans of it’s next target before actually putting it’s plan in motion. Therefore the benefits of a virtual world must be weighed against the possible negative effects as a virtual world can help a autistic child, it can also be a medium leading to negative outcomes. For some, the two worlds, the real and virtual, start intertwining which leads to problems in the one world that matters: the real one. As example, a few years ago there was a case where one user’s World of Warcraft account was erased causing the affected user to seek retribution in the real world which lead to their arrest. Spending too much time in the virtual world, which ever that may be, leads to a loss of contact with reality and a further immersion in the virtual. How do virtual worlds foster creativity? Virtual worlds give the user the chance to reinvent themselves, and the anonymity of a username spurs creativity. We are restrained in real life by what others may think of us or by social norms, but when hiding behind a username we can be/do whatever we want. As a simple example, just look at any forum discussing any current event; there will be opinions posted of the strangest kind, and proposals of the weirdest nature. Anonymity gives us wings and where better to fly than the one place where anything is possible: The Internet. What do you think the future of virtual worlds will look like? The Holodeck on the Starship Enterprise… or The Matrix if we let the machines run independently. For those not knowing what a Holodeck is http://en.wikipedia.org/wiki/Holo_deck. Why have a Second Life at your computer when you can have it IN the computer. If any of these technologies don’t materialize, virtual worlds will become paid service trying to differentiate from one another by making the user feel in the real world and providing services that are not only leisure oriented but productivity oriented. Facebook, MySpace, Twitter, Google+. What do they have in common? What makes them different? Google+ is Google Inc’s response to Facebook, we all know that, but where does MySpace fit? It seems we lost it for a moment there, as it became the “not it” place once Facebook took off like wildfire a few years ago. Where does Twitter fit in? Well, Twitter is not like the others (remember the “which one doesn’t belong?” question). Twitter is focused on short bursts or tweets where as the other three are more content centered. MySpace for example is like Facebook with the added feature that allows for blogging and video uploads. It is like the Yahoo profile page of last decade (remember those?). At a glance the three (FB, MyS, G+) look alike and seem to fulfill the same role to the end user, but is it so? Quickly looking on Facebook we notice that it is mainly used to keep in touch with friends (to be read, brag about where I’ve been and post my views through links and or commentaries). MySpace blogs about anything and is actually useful to up and coming artists trying to get their names out there by maintaining something that almost resembles a web page with info and pictures/video of their creations. Google+, for me at least, didn’t quite take off and it is filled with stories of interest from people I never met or news. So is Twitter, tech news, political news, and so on. Of them all, MySpace is the most content filled, pictures and videos on all pages, the least content is on Twitter but that is starting to change with the use of pictures and video being twitted.